A valid prescription is required to buy Estrofem online. Estrofem® is a medication that comes in tablet form and is taken orally. Estrofem® contains Estradiol which is a form of Estrogen hormone. The particular type of Estradiol in Estrofem is called Estradiol Hemihydrate, it’s a synthetic Estradiol compound. 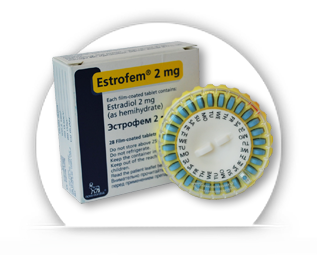 Estrofem is sold under various brand names like Estrofeme and Evorel. Estrofem® is used in women to prevent osteoporosis and control the symptoms of menopause. It can also be used for women post-hysterectomy to help maintain Estrogen levels. Estrofem® contains the female Estrogen hormone called Estradiol which is often prescribed to help reduce the side effects of menopause. Side effects of menopause include hot flashes, night sweats and anxiety. When you go through menopause your hormone production slows down, causing your hormone levels to drop and become erratic. A drop in Estrogen is known as Estrogen Deficiency and it can cause some of the most frustrating side effects of menopause. Estrofem® contains a good level of Estradoil so it helps to recover Estrogen levels in the body. It does not help the body produce more Estrogen but it adds more of the hormone into the body to make up for the missing quantity. Menopausal treatment like Estrofem® are normally referred to as HRT (hormone replacement therapy). Doctors also prescribe this medication to prevent osteoporosis in postmenopausal women as Estrogen is needed for bone health and after menopause Estrogen levels remain continually very low. Estrofem® tablets should be taken with water but unlike other forms of HRT and birth control Estrofem® is not taken once daily at the same time of day, every day. You should follow your doctors instructions on the dosage. The dosage of Estrofem® can vary depending on your medical history or purpose of using Estrofem®. For example, women who have undergone a hysterectomy can normally start treatment on any day and are usually prescribed one Estrofem® tablet a day for the full 28 days of the packet. If the doctor confirms it’s OK, then these women can go straight on to the next pack. For women who haven't had a hysterectomy dosage is more complicated. Normally women start taking Estrofem® on day 5 of their cycle and only take it for 10-14 days of their 28 day cycle. Sometimes other medication is also needed and you may be required to take it at the same time as Estrofem®. Only take Estrofem® as instructed by your prescribing doctor. Like all birth controls and hormone treatments, Estrofem® can sometimes cause side effects. This normally happens at the start of the treatment when your body is adjusting to the new levels of hormones. Sometimes the side effects of Estrofem® can stay for longer though. Make sure you discuss all side effects of Estrofem® with your doctor, especially the ones that really bother you. Most of the time Estrofem® side effects are not serious and only require monitoring. Itchy skin, changes in the growth of hair, tenderness or enlargement of the breasts, leg cramps and oedema are the most commonly reported side effects. If you notice any pains in your legs, have any blood clots, severe headaches, problems with vision then contact your doctor immediately. These can be serious side effects. See the full pack insert for more side effects and drug interactions. When taking Estrofem® you should have your breasts checked professionally at least once a year and do self-examinations once a month to check for lumps. Taking Estrofem® can increase your chances of developing breast lumps, even though the statistic is not that high it’s still something worth keeping on top of. Try to avoid smoking when using Estrofem®. Smoking increases the risk of developing blood clots and high blood pressure as well as generally being bad for your health. Estrofem®, along with other Estrogen based medicines has been associated with an increased risk of ovarian cancer or other serious diseases. Make sure your doctor explains all the benefits and risks involved before you begin using this medicine. Estrofem® is an Estrogen based product and it may interact with over the counter and prescription medications. It can even have interactions with vitamins, minerals and herbal products. Always inform your doctor of when you start taking new medications before you start taking them to make sure that they will not interfere with the Estrofem® course of treatment and Estrofem® will not interact with them. You can also talk to a pharmacist about drug interactions if your doctor is not available. The information about Estrofem® on this site is purely educational; it does not replace a doctor’s consultation.